In every sport and game we have to calculate score. We want to design a software system for score management. Score management system will record all game scores separately. Score will be stored and display on TV score bar, website, mobile app (android and iPhone) and send to subscribers through SMS automatically. There are many cameras and sensors in ground field. Score management system utilizes these sensors to record score/activities automatically; system will record these statistics in database. Sensors work and available all the time. These sensors extract score related information from the field and send it to the score management application. Score management system will infer and declare a valid score and adds up to the already existing scores. These sensors also assist umpires in different decision makings. This Score management system will have all players profile with their career. It should have current match statistics as well as concerned game history. A user will register him/her on website of mob application. The user can choose category and check score board of selected category. The admin will login into system. 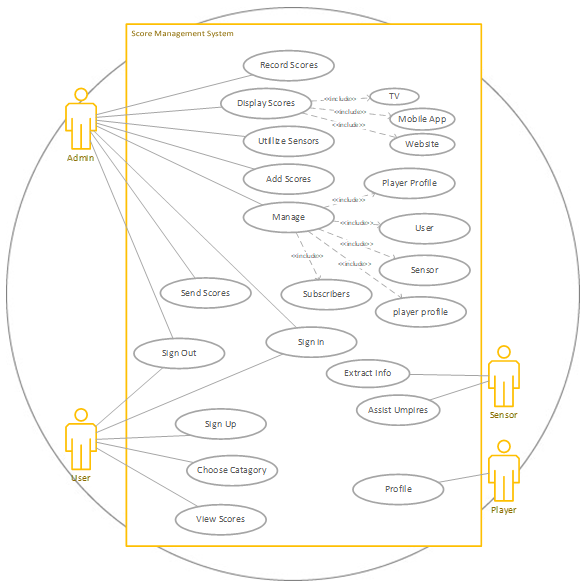 He will manage activities of system and users such as check sensor, mange players profile and manage subscriptions etc. By considering the above scenario you are required to draw Use Case Model for “Score management system”. Also mention Includes, Extends and hierarchy between each use case.